Apart from the vibrant contrast in colours, this dish is amazing. It has a wonderful array of textures and flavours; roasted red onions and aubergines, chopped coriander, mango and lemon zest – and then those wonderful noodles. 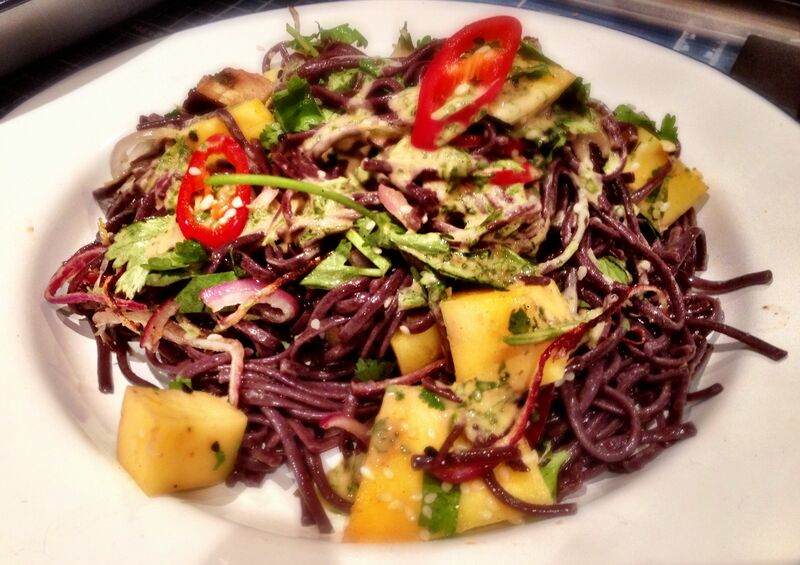 Black rice noodles look amazing don’t they. Amazingly purple. They taste amazing too. They aren’t readily accessible in supermarkets – I ordered mine from Amazon and they weren’t that expensive as long as you buy in bulk. Black rice noodles are rich in minerals such as manganese, calcium and zinc. They are also high in fibre. They only took 5 minutes on a rolling boil and they were done. They just need rinsing and refreshing in cold water as the water gets rather gloopy. I was initially disappointed that my mango was too firm and not very juicy – but as it turned out to add an extra crunchy texture to the dish. A ripe mango might have changed this dish completely; as I will find out next time I make it. Also, I used baby aubergines rather than regular ones, and I think the bigger ones would have roasted up better. There was too much skin on the baby aubergines and the skin is much tarter than the flesh in my opinion. Again I’ll try changing that next time I make it. This dish was drizzled with a Tahina dressing – which was a simple blend of tahini, tamari, garlic, coriander and sesame oil. It added a very nice twang to an already amazing dish. I put this together in less than 30 minutes – so it’s quick and easy. Just as well given I only started making it at 9pm – having spent all day at the boat – making a wardrobe from scratch. Got to put those clothes somewhere. Here’s an interesting ‘risotto’ from Honesty Healthy. Essentially the risotto rice is replaced with Quinoa – but the principle of making it is the same. Quinoa is an amazing ingredient. Most people think it is a grain – but its actually a seed. It is packed with protein and omega-3 so it makes so much sense to substitute it for rice whenever you can. This risotto is pretty sparse on ingredients – apart from the quinoa and stock, you only add mushrooms and goats cheese. And when you are ready to serve you pour over a parsley butter – that’s it! I was a little disappointed with how mine turned out as I couldn’t really taste the goats cheese that you add at the end – and my mushrooms were tiny – so the dish didn’t look as impressive as I would have liked. I do think the quinoa probably needed cooking a bit longer that I did – to make it more gloopy and soft. 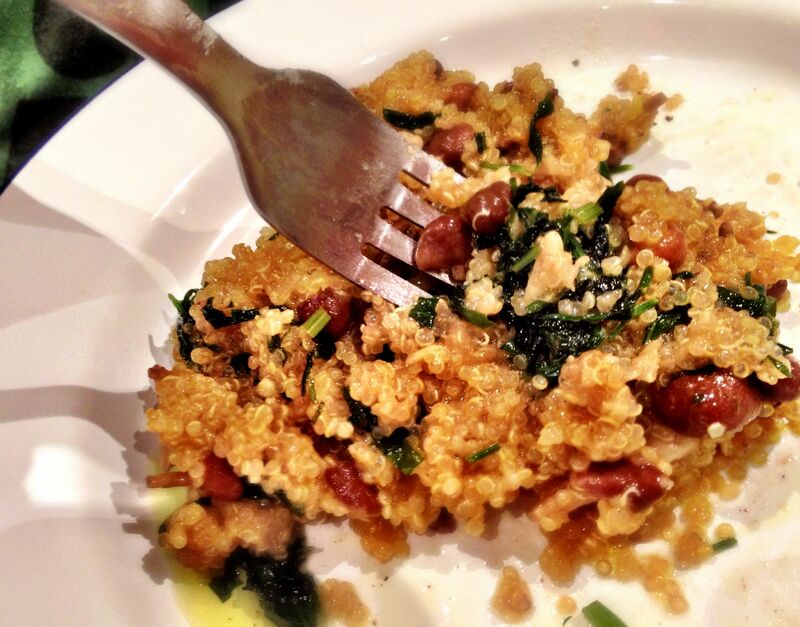 Some of the quinoa was a bit firm and something in the dish was gritty – maybe it was in the mushrooms – I’m not sure. That said – it was very tasty. It tasted like a genuine risotto – not just a poor imitation. The parsley butter was essential; it lifted the dish and made everything more tasty. I’ll definitely make it again – just with some nicer wild mushrooms and maybe a tastier goats cheese. Hot chocolate is our ‘go to bed’ drink pretty much every other day. I tend to dabble with a variety of made up recipes. Lately the one that’s been working for me includes Green and Black’s Cocoa Powder, Twinings Hot Chocolate Powder, Hazelnut milk, and right at the end when it’s hot I squirt in some Carnation Condensed Milk. It’s a delight! This recipe – from Honestly Healthy calls for one of my ‘specialist’ ingredients – not that specialist – I just couldn’t get it on Ocado. 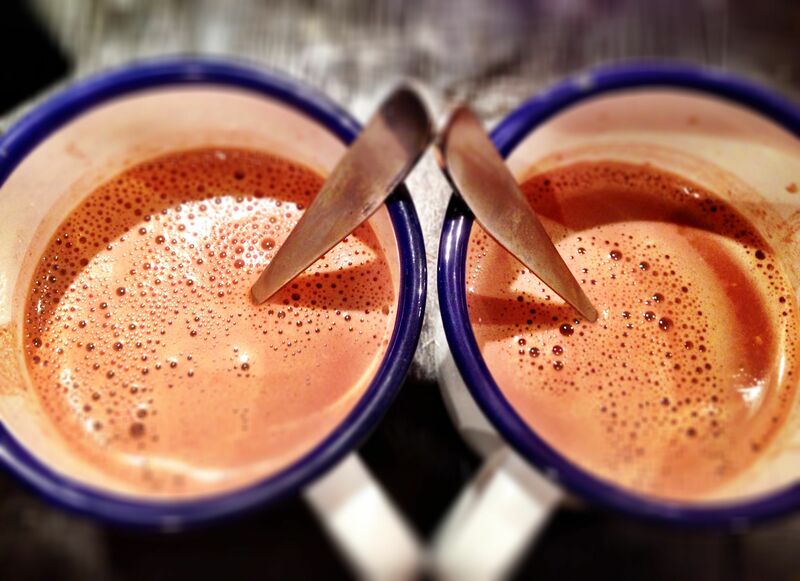 For this hot chocolate you blend coconut milk, raw cacao powder (I got mine from amazon), raw cashew nuts and agave syrup until it is smooth – then you simply heat it. My blender didn’t blend the nuts too well so it was a bit grainy. I think I’ll pop over to my mother in laws and blitz a kilo of cashews in her Thermomix – as that amazing device will reduce anything to a powder. This was really tasty – just a shame about the bits in the bottom of the mug. 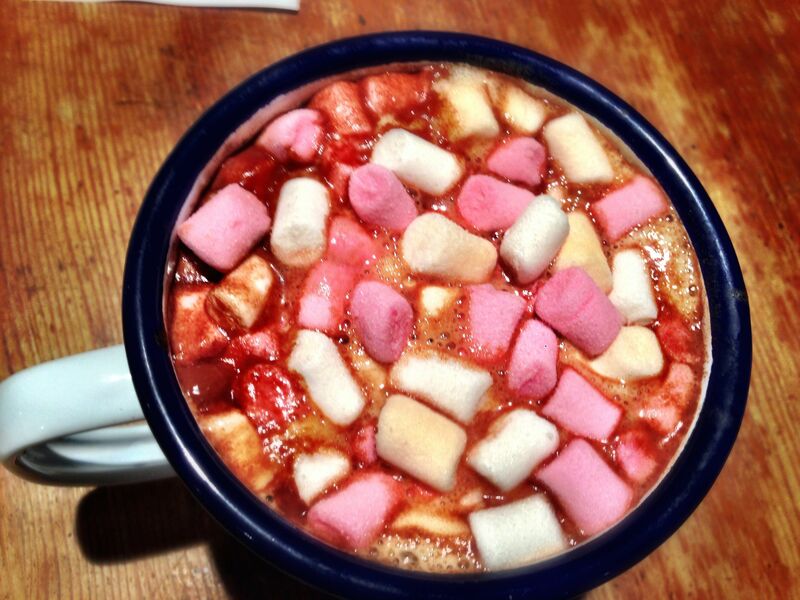 Here’s a picture of my not so healthy Hot Chocolate – topped with mini marshmallows that I got for Christmas this year. I’m not generally one for breakfasts. We usually get up and go to work on just a cup of tea. If we feel like it we might have some ‘free toast’ from work. There is an abundant supply of bread at work – ducks would be in their element. We’ve decided to start eating breakfasts as we usually struggle to make it to lunch time and end up grazing on things. Steve at work has a jar of sweets that everyone dips into – and by 11am you find yourself scooping out it’s contents to get you through to lunchtime. So, we’ve done the ‘perfect omelette’ (I usually save omelettes for the weekend when we need some sustenance for boat work) and today we have granola. I made this last night. It’s not all that time consuming but I think you’ll need at least an hour to make it – and however long it takes for the granola to cool down before you add the apricots. It’s pretty simple. 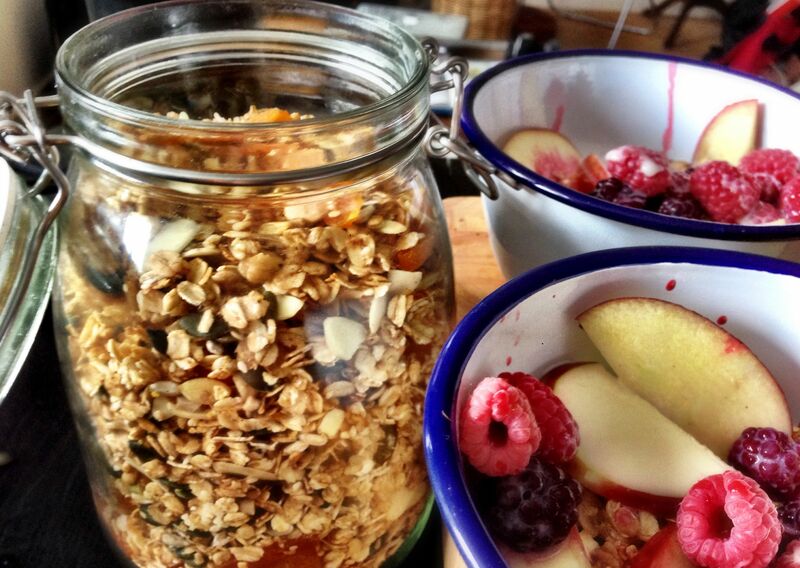 You roast jumbo oats in agave syrup, cinnamon and sunflower oil. You then add in sesame seeds, pumpkin seeds, sunflower seeds and almonds and keep roasting until it’s all golden. When it’s cold you stir in some chopped dried apricots. We had some for breakfast this morning with a handful of raspberrries and blackberries, a sliced apple and a good glug of almond milk. It looked quite nice in my new enamelware pudding basins which double up as breakfast bowls. Very very tasty and sure to keep us going until lunchtime. I made rather a lot of this so the rest of it I’ve decanted into a kilner jar (as the recipe suggests) so that should serve us well for several breakfasts to come. For my birthday this year Freya bought me this book. 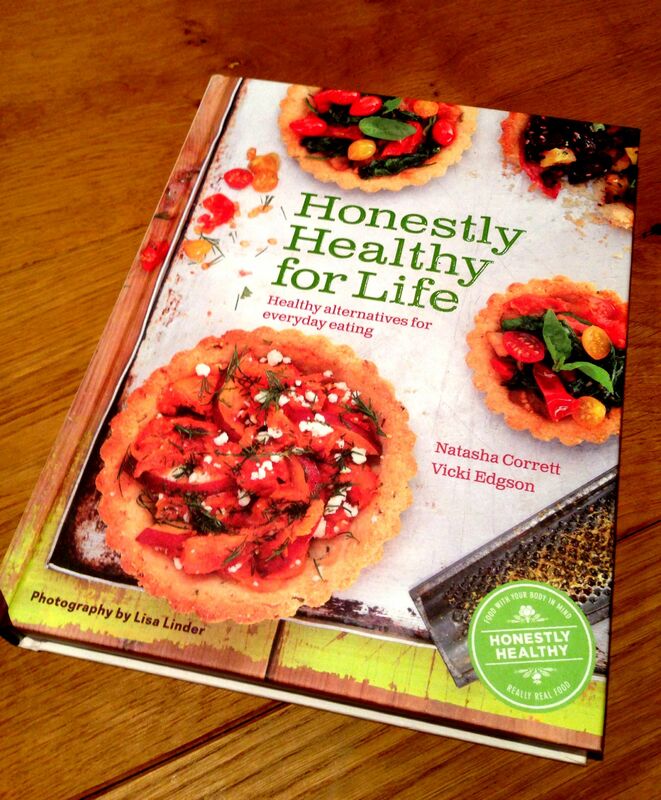 Honestly Healthy for Life – by Natasha Corrett and Vicki Edgson. She also got me some enamelware. This book focuses very much on reducing acid intake – thus pretty much eliminating meat and dairy – and focusing on eating a lot more pulses, grains and vegetables – and in the correct proportions. There are over 60 pages on dietary facts and how eating certain foods together will help you naturally lose weight, improve digestion and generally be healthier and have more energy and feel less bloated. Sounds good doesn’t it! Especially given I’ve been trying to do that anyway without any advice – cutting out meat and dairy, wheat and carbohydrates wherever I can. 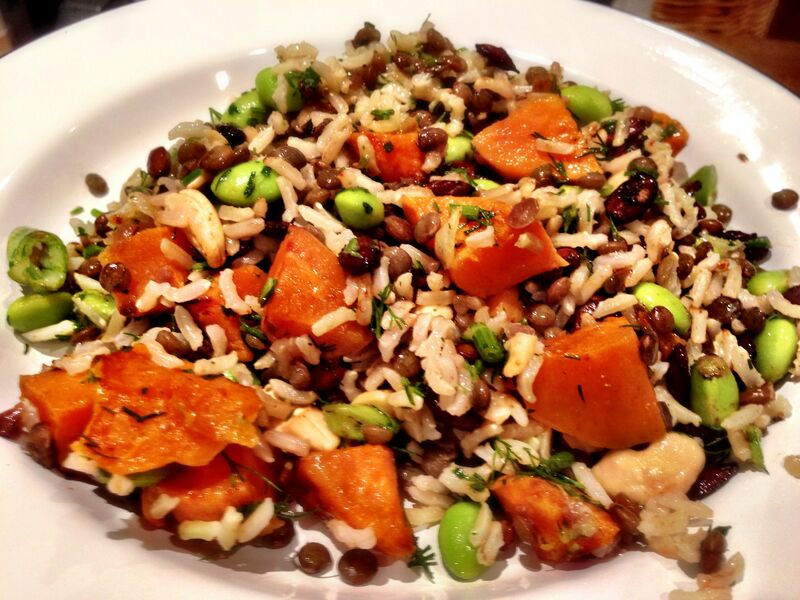 We’ve already made the Puy Lentil, Brown Rice and Sweet Potato Salad – as you may have seen. That was yummy – and I expect everything else will be too! This is going to be an expensive weeks eating – the week’s shopping on Ocado was over £150 – and I spend another £60 on Amazon for the speciality ingredients! I was so impressed with the first impressions of this book that I ordered their first book ‘Honestly Healthy – Eat With Your Body and Mind the Alkaline Way’ – shame that – my mother-in-law already had it and I could have pinched hers ! The day turned out to be a nightmare. We lost water to our house – the neighbours had cut through the pipe, and our boat became untied from our mooring on the Thames – when a storm caused the mooring to come apart. Our 20 tonne, 60 foot long, iron dutch barge was at 90 degrees to the Thames – hanging on with the tiniest rope and I had to pull it in – all 20 tonnes of it. It wasn’t pleasant at all. Very very scary – who knows what would have happened if the other rope would have given way. Anyway – we got away with it – and we live to cook another dish ! I think I’ve just made the best thing I’ve ever eaten – and apparently it’s incredibly good for you too. 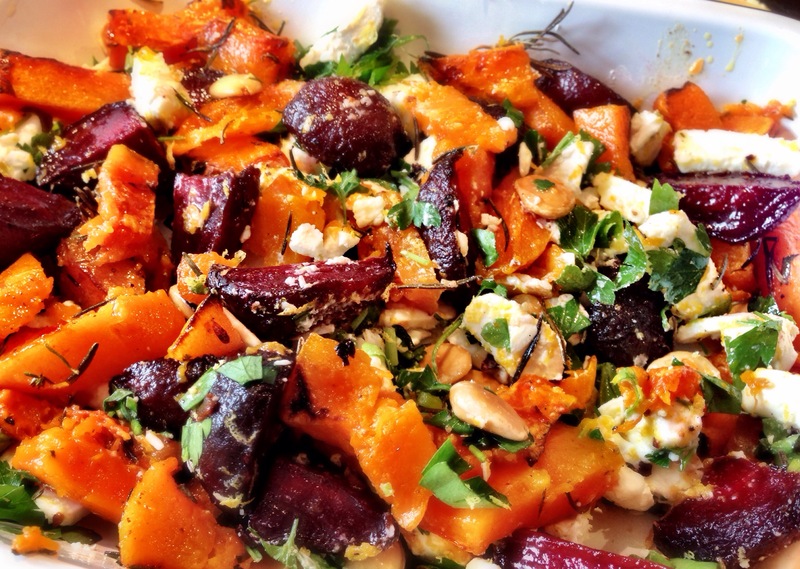 This recipe comes from ‘Honestly Healthy for Life’ by Natasha Corrett and Vicki Edgson. This was my birthday present from Freya (the book not the meal) – and I’m really chuffed with it. There are so many textures and flavours going on in this recipe. Brown rice and puy lentils, sweet potatoes, edamame beans, cashews, pumpkin seeds, spring onions and dill – hmm its just so yummy – and I know I’ll make this regularly. If I had a top 5 this would be in it. The pumpkin seeds are especially interesting as they are roasted with tamari (soy sauce) and they end up with a lovely intense flavour that really contrasts with everything else. There is also a dressing of sunflower oil, parsley, lemon and salt which keeps it all nice and moist and gives a nice citrus tang. The dill also really features well. You really have to make this dish – we had it warm – but only because time was getting on and I was hungry and impatient for it to cool down. We only ate half so no doubt this will be lunch for tomorrow – and I can’t imagine it being any less awesome cold!